: If this grain were oil…. The third train-car derailment in as many weeks has Pacific Northwest tribes that oppose oil-rail transport on edge. It has happened again, this time not with oil but with grain. However, the Quinault Nation pointed out on May 16, the derailment of a grain train in Grays Harbor County is all the affirmation needed to show that transporting something more hazardous, namely oil, in this manner has too much chance of ending badly. Sharp was alluding to a May 15 incident in which seven cars carrying grain tipped over when 11 cars on the train they were part of derailed. It was the third such occurrence in as many weeks on the network of tracks operated by Puget Sound & Pacific Railway in the Grays Harbor area, the Quinault statement said. 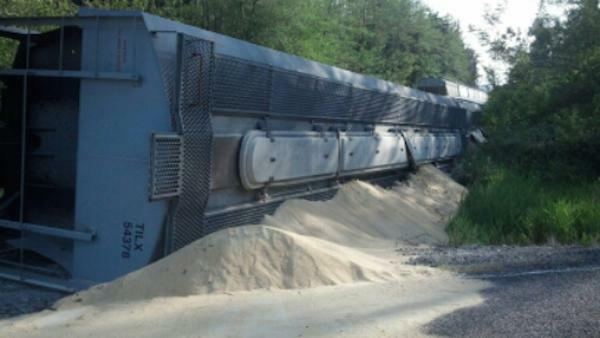 This came right on the heels of two earlier derailments—one on April 29, when a grain car tipped over in Aberdeen, and another on May 9 in east Aberdeen, when some cars came off their tracks, the Quinault said. The cargo was different, but the propensity of train cars to derail no matter what they were carrying says that transporting oil via this method is not safe, the Quinault said. Around the country and in Canada, derailments of trains bearing crude oil, much of it from oil sands and deemed especially flammable, have resulted in destruction and even death. However, Puget Sound & Pacific Railway, a division of Genessee & Wyoming, said it was investigating the cause of the derailment. Several tribes in the Northwest are opposing railroad terminals in or near their territory that would handle oil and coal. Oil traffic in particular has troubled the Quinault. TAHOLAH, WA – The Quinault Indian Nation (QIN) is adamantly opposed to increased oil train traffic in Grays Harbor County, the construction of new oil terminals, increased oil shipping from the port of Grays Harbor and dredging of the Chehalis River estuary. “We oppose all of these for both economic and environmental reasons,” said Fawn Sharp, QIN President. “We ask the citizens, businesses and agencies from within the county and beyond to stand with us in opposing the intrusion of Big Oil into our region,” she said. “The small number of jobs this dirty industry brings with it are vastly outnumbered by the number of jobs connected with a healthy natural resources and a clean environment,” she said. “It is time for people from all walks of life to stand up for their quality of life, their children and their grandchildren. It makes no sense whatsoever to allow Big Oil to invade our region, especially with the volume they are proposing. We all have too much at stake to place ourselves square in the path of this onrushing deluge of pollution, to allow mile-long trains to divide our communities and jeopardize our air, land and waters,” she said. “Consider the number of jobs that are dependent on health fish and wildlife. The birdlife in Grays Harbor alone attracts thousands of tourists every year. Fishing and clamming attract thousands more. And anyone who listens to Big Oil or their pawns when they tell us how safe the oil trains are, or the ships or even the oil terminals that are being proposed needs to pay closer attention. We have already had large quantities of fish and shellfish stolen from us through development of and damage to Grays Harbor and its tributaries and we are not accepting any more losses. We want restoration, not further damage,” she said. “Derailments, crashes, spills and explosions are extremely dangerous and they happen with frightening regularity. The fact is that there will be accidents and there will be spills, and they will do extensive damage,” said Sharp. U.S. Development Group is currently seeking permits to build an oil terminal on the Washington coast that could handle about 45,000 barrels of crude oil a day. The $80 million proposal at the Port of Grays Harbor is one of several in Washington that together would bring millions of barrels of oil by train from the Bakken region of North Dakota and Montana. About 17 million barrels of oil were shipped across Washington State last. That number is expected to triple this year. Grays Harbor is facing three separate crude-by-rail proposals. Westway Terminal Company, Imperium Terminal Services, and U.S. Development Group have each proposed projects that would ship tens of millions of barrels of crude oil through Grays Harbor each year. Daily trains more than a mile long would bring crude oil from North Dakota or tar sands crude oil from Alberta, Canada along the Chehalis River and into the port, where it would be stored in huge shoreline tanks. The crude would then be pumped onto oil tankers and barges, increasing at least four-fold the large vessel traffic in and out of the harbor. Westway Terminal Company proposes five new storage tanks of 200,000 barrels each. Westway estimates it will receive 1.25 unit trains per day or 458 trains trips (loaded and unloaded) a year. The company estimates it will add 198-238 oil barge transits of Grays Harbor per year. “The chances are even those counts are very conservative,” said Sharp. Imperium Terminal Services proposes nine new storage tanks of 80,000 barrels each. With a capacity to receive 78,000 barrels per day, Imperium may ship almost 28.5 million barrels of crude oil per year. Imperium estimates that the terminal would add 730 train trips annually, equaling two, 105-car trains (one loaded with oil on the way in, one empty on the way out) per day. The company estimates 400 ship/barge transits through Grays Harbor per year. U.S. Development Group submitted its application in this crude-by-rail race early this month. It proposes eight storage tanks each capable of holding over 123,000 barrels of crude oil. The company anticipates receiving one loaded 120 tank car train every two days, and adding 90-120 Panamax-sized vessel transits through Grays Harbor per year. “We are targeted by Big Oil,” said Sharp. “We will not allow them to turn our region into the greasy mess they have created in other regions. We care about our land and our water. We realize how important our natural resources are to our future and we’re not going to sit by and let them destroy what we have,” said Sharp. Deborah Hersman, outgoing chair of the National Transportation Safety Board said on April 21 that U.S. communities are not prepared to respond to worst-case accidents involving trains carrying crude oil and ethanol. In her farewell address in Washington DC, she said regulators are behind the curve in addressing the transport of hazardous liquids by rail and that Federal regulations have not been revised to address the 440 percent increase in rail transport of crude oil and other flammables we have experienced since 2005. Hersman, who is leaving her post at NTSB April 25 to serve as president of the National Safety Council, said the petroleum industry and first responders don’t have provisions in place to address a worst-case scenario event involving a train carrying crude oil or ethanol. Hershman added in her comments that the DOT-111 rail tank cars used to carry crude oil are not safe to carry hazardous liquids. She also said that NTSB is overwhelmed by the number of oil train accidents. At present, she said the NTSB is involved in more than 20 rail accident investigations but only has about 10 rail investigators. “It makes absolutely no sense for us to allow our communities to be exposed to the same dangers that killed 47 people in Quebec this past summer. That tragedy was not an isolated incident. It could happen here, and there is absolutely no doubt that this increased oil traffic will cost us all in terms of both environmental and long term economic damage,” said Sharp. “We strongly encourage people to show up and make comments and submit written testimony at these hearings,” said Sharp. “A good turnout is a must,” she said. Following the hearing, written comments can be sent to Maia Bellon, Director of the Department of Ecology, at 300 Desmond Drive, Lacey, WA 98503-1274. To join QIN in this effort, please email ProtectOurFuture@Quinault.org. “Together, we can protect the land and the water for our children, and rebuild a sustainable economy,” said Sharp.